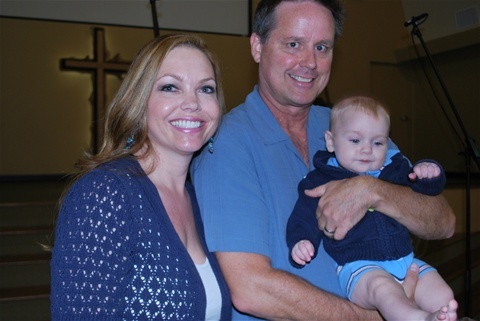 A couple of Sundays ago, our family gathered again in the chapel at First Christian Church of Huntington Beach to dedicate another beautiful little boy to the Lord. Brady Benjamin Davis, who had the exquisite taste and good planning to be born on my birthday, is now six months old and the cutest little guy you ever saw, with the exception of his brother, Caleb Nicholas Davis, who is now two. Caleb was working very hard at being two during his brother’s dedication, feeling this rather dull ceremony, which was taking way too long in his estimation, needed a little music, he proceeded to the piano, but was dissuaded by his mom, Michon. All the grandparents vowed to do our best to be a good influence on Brady, his parents vowed to do their best to train up their child in the way he should go so that, hopefully, when he is old he will not depart from it (Prov. 22:6) and so did all the aunts and uncles and everyone else in attendance. The Pastor used the verse about Jesus and little children and it was a joyful time. Brady enjoyed the moment, as did his parents, John and Michon. As I watched this little guy and his brother, other baby dedications came to mind, like when we brought Christine to be given to God when she was just a few weeks old. Dear Pastor Earl Lee, whose large hands had held hundreds of babies and blessed them in the name of the Father, the Son and the Holy Spirit, assured me that he wouldn’t drop her. New mommies are nervous! She went along doing just fine until July 19, 1974, when we almost lost her in an accident in front of our house. She was racing out to get ice cream from the ice cream man and almost raced right into heaven. It was a tough summer, but she got through it, went to Kindergarten in the Fall, and is now a wonderful mom to our Texas girls, Jessie and Emily. Our gratitude knew no bounds and now, so many years later, we are still thanking God for His mercy and His grace, to restore Crissy to us. We felt that as she had been back to us that we needed to give her to the Lord again, and so we did when she was five. It was a beautiful moment, this time with Pastor Lee kneeling on the floor to be next to Crissy. But then, when you’re holding a little person up to the Lord and saying that you want her to belong to Him, it’s like the clouds part and, even though you can’t see it, there is a beautiful ray of light shining down straight out of heaven.